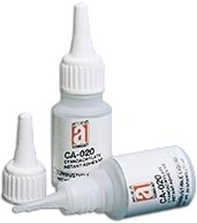 Instant Adhesives CA-020™ (Regular Viscosity) instant adhesive is an ethyl-cyanoacrylate adhesive. CA-020 is a general purpose, fast-curing product with good elasticity for bonding plastics, metal, rubber, glass, and dissimilar materials. CA-120™ (Medium Viscosity) instant adhesive is slightly thicker for those applications requiring less run off. Better for metal and ceramics. CA-220™ (Non-run Gel) instant adhesive for overhead or vertical areas where the adhesive must stay put during pre-assembly. Best for porous surfaces. Temperature Range: -40° to 180°F (-40° to 82°C), Intermittent 250°F (121°C). Applications: Electronic equipment including PC boards, connectors, and transformers. Plastic cases, rubber fabrication and gaskets, appliances, and office equipment.